In the bushcraft world, fire is one of the main things people want to master. This is easier when its nice and dry and sunny but much more difficult when it is chucking it down with rain. There is a paradox with making fire. The greater the need, the harder it is to achieve. This is where feather sticks come in. They require quite a lot of practice to perfect but a good quality feather stick will light from a simple spark and can be a life line if you are short on dry tinder and kindling. 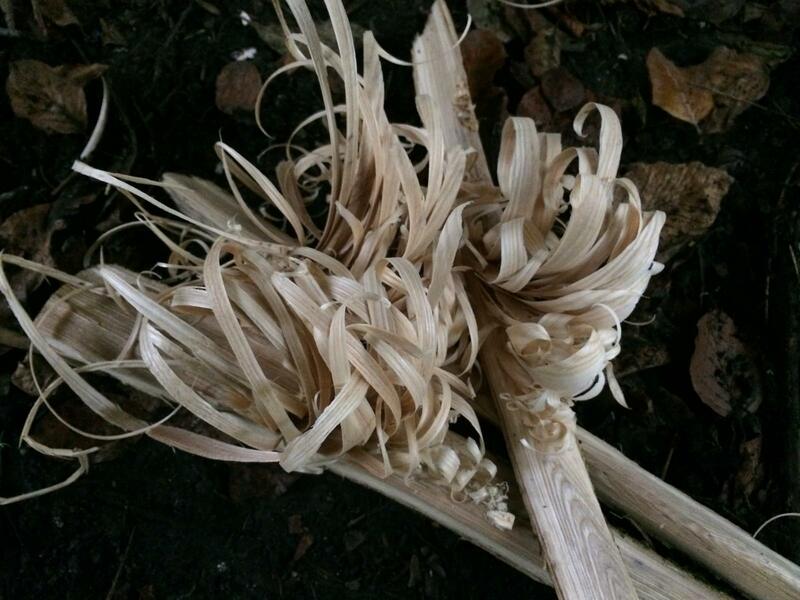 So how do we go about producing a feather stick? First of all you will need a sharp knife. Here at Wildway Bushcraft we use the Bear Blade 4’’ Classic. These are a great all round bushcraft knife, made by a local guy in Dorset. We try where ever possible to support bushcraft in Dorset, working closely with local partners, Wildway Bushcraft believe our bushcraft courses are extra special because of this. But I digress! Once you have a sharp knife, you need to find some dead wood. Wood from a dead standing tree is ideal. You will need to find a knot free piece approximately 30 to 40cm long and 5 cm in diameter. Once you have a suitable bit of wood you need to access the dry wood inside. You do this by splitting the wood into quarters. Use your knife to batten though the wood. You should now have a triangular shaped piece of wood to create your feather stick. Now comes the hard bit! I find it easier to sit down at this point and place the wood to my right side as I am right handed. Put one end on the ground or chopping block and place the other end close to the top of the outside of your thigh. I found this to be the best position for me but you will want to tweak it a bit to make yourself comfortable. Lock off your arm at the elbow and use your knife to shave down the wood by bending at the waist. This will give you steady smooth pressure and prevent the knife getting stuck in the wood. You will want 2 or 3 of these to give yourself the best chance of getting your fire going. Remember maximise you chances when ever you can! You should now have the makings of a good fire collect all the small sticks you can and prepare your fire as you would normally. The small curls will now take a spark and catch a flame. This will then light the larger curls and so on and so on, giving you a nice warm fire. It is really rewarding to light a fire this way. 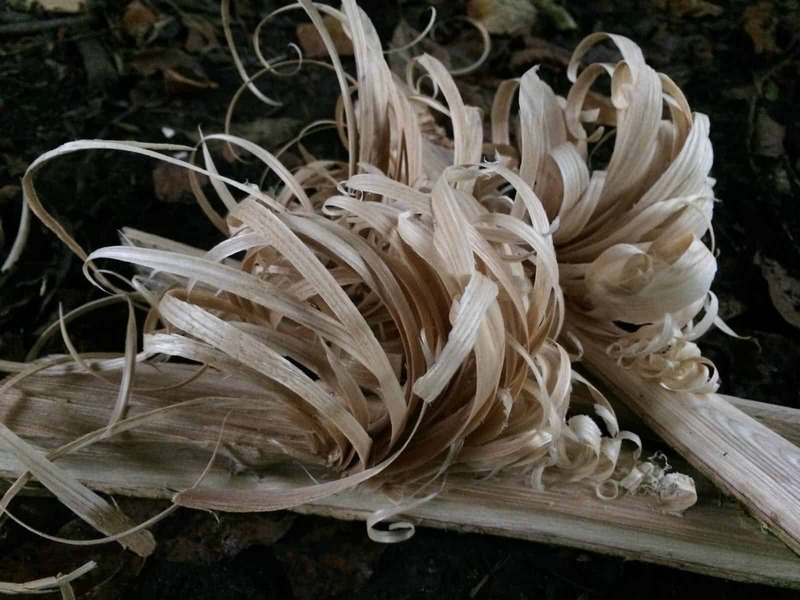 The guys at Wildway Bushcraft are always carving feather sticks when they are not teaching lessons on our bushcraft courses as this is a skill that is often over looked. Once you have mastered this skill you will have a great tool in your bushcraft armoury and the confidence to create fire in the wettest of conditions. All our bushcraft courses are held in Dorset so why not join us in the woods to learn much much more. After all, Wildway Bushcraft is about more than just survival! Any thing dead dry and knot free should work well. Hazel, Pine and Cedar works very well as does Chestnut. Let us know how you get on!